Oye Productions: Shake Your Peace! SHAKE YOUR PEACE! is a San Francisco Bay Area based band known for their ebullient live performances, radical ecological & social justice politics, and bicycle-based music tours. Founded by Lead Singer and Guitarist Gabe Dominguez, SHAKE YOUR PEACE! has created a new style of music called Whup, a celebratory and political dance music style combining Afro-Latin rhythm, bluegrass fiddle, black gospel choir-style harmony, call & response, spirit invocation, and Dominguez's own anarchistic take on the American folk and pop/rock music traditions. 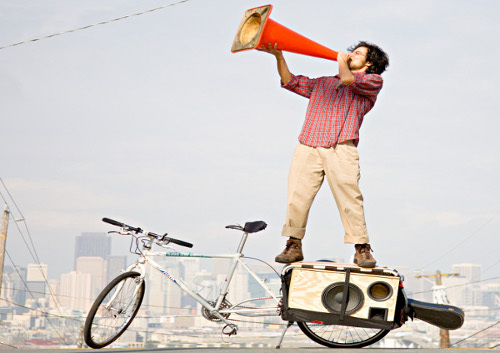 In the Fall of 2011, at a bicycle-powered concert at UC Berkeley's historic Sproul Plaza, the Whup sound was unveiled with a seven-piece version of SHAKE YOUR PEACE! The band featured an all-star lineup of Bay Area musicians from the bluegrass, salsa, rock, and world music communities. Since its debut, the band has been honored to perform at venerable Bay Area stages and events including Yoshi's San Francisco, PedalFest in Oakland's Jack London Square, Cafe Du Nord, MakerFaire, the Bicycle Music Festival, and opened up fro Rupa & the April Fishes on the legendary Bay Rising Tour 2012. You can SHAKE YOUR PEACE! at one of their upcoming shows in the San Francisco Bay Area.